Citation: Sofia D, Sofia T, Evangelos P, et al. Self-Esteem and Anxiety Level of Students at the Technological Educational Institute of Athens– Planning of Interventions. Health Sci J 2017, 11: 3. Copyright: © 2017 Demsia S, et al. This is an open-access article distributed under the terms of the creative Commons attribution License, which permits unrestricted use, distribution and reproduction in any medium, provided the original author and source are credited. The concept of self-esteem integrates cognitive and emotional as well as interpersonal dimensions of the perception of the self. Private assessments of the self embody reflections on the individual’s interactions in his/her social world  and emotional contents linked to these assessments (satisfaction/ pride for self, feelings of inadequacy, shame etc.) [2-4]. There are many different approaches to self-esteem, with Rosenberg  being one of the first theorists to focus on the sense of personal value (“worthiness”), namely on the person’s value judgments on self. According to Rosenberg, people with high self-esteem tend to appreciate themselves more, but at the same time, value others. Earlier than that, in the psychoanalytical tradition, Bibring  had described depression as a collapse of the ego’s self-esteem, a state where the ego “feels unable to live up to its aspirations” to feel good, worthy, competent and appreciated by the others. Mruk  defined self-esteem as the experienced sense of the individual that he/she is capable of dealing with everyday challenges “in worthy ways”. Still other authors emphasize the cultural meaning of self-esteem, supporting that the concept is typical of the Western individualistic culture and not a universal human incentive . For instance, within the framework of a religious culture, high self-esteem is related to arrogance, while modesty is considered a virtue and a prerequisite for a person’s development, while in other contexts as, for instance, in the traditional Japanese culture, the imperatives of collective values are regarded as more important than individual success, recognition and self-esteem demands . Beyond any differences in the conceptualization of the term, most theorists agree that at least in the modern western world, self-esteem is thought to be a basic human need linked to the overall quality of life as well as physical and mental wellbeing [9,10]. Low self-esteem has been associated with increased risk of depression, substance abuse, delinquency , anxiety disorders and particularly, social anxiety [12-15]. Rosenberg  had already related low self-esteem with “neurotic anxiety”, while on the contrary, high self-esteem is considered a “protective filter” against stress  as it allows individuals to employ more efficient strategies for managing difficult life situations [16,17] found a significant negative correlation between self-esteem (as assessed by Rosenberg’s questionnaire) and perceived stress (Perceived Stress Scale) in adolescents and argued that self-esteem may mediate the relationship between stress and substance abuse in adolescence. Although people with high self-esteem seem to be more success - oriented  there are several studies that do not identify a significant relationship between academic performance and self-esteem . Some authors argue that low self-esteem does not necessarily indicate poor academic performance  and that the positive effect of self-esteem on educational achievement is either small  or concerns mainly the ages between 7 and 15 . However, a number of other studies have demonstrated significant positive correlations between good academic performance and high self-esteem [8,23,24] thus reinforcing the view that selfesteem is a source of academic achievement [25,26]. Although methodological differences among the above studies constrain the effort to integrate their findings, several studies support a reciprocal relationship between self-esteem, academic performance and anxiety [27,28]. The direction of the causal link between the three variables is difficult to determine, but their relationship could be considered a twoway, as self-esteem and anxiety may affect performance, while at the same time educational experiences can exert their own influence on self-esteem as well as on the amount of stress experienced. For instance, the experiences of academic achievement may increase the students’ self-esteem [29,30], while, on the contrary, low self-esteem and the feelings of anxiety accompanying it, are likely to constitute significant obstacles to the learning process [31-33]. The same may be true for very high self-esteem, as this may be accompanied by exaggerated expectations of self, which can cause frustration and negative emotions that may be inhibitory to the educational process . Based on the literature review, self-esteem and anxiety are factors associated with the general well-being level of people and probably to their academic performance. The self-esteem and anxiety levels of students are a matter of particular interest for educational institutions wishing to encourage their learners’ active involvement in education. In this respect, it is important to plan supportive interventions to help students cultivate healthy self-esteem and acquire anxiety management techniques, not only for the purpose of learning, but also for progressing to their psychosocial identity consolidation and acquiring skills that will help them meet the challenges of modern reality. The purpose of the present study was to investigate the selfesteem of students at the Technological Educational Institute (TEI) of Athens, the anxiety level experienced and the possible correlations of these two parameters to each other as well as to other demographic variables. More specifically, according to the literature review, the anxiety level of students is expected to show a statistically significant negative correlation with the level of their self-esteem. This combination of high anxiety level and low self-esteem could possibly be associated with poor academic performance, as assessed by the students’ average grade and the number of failed courses. However, due to the impact of socio-cultural patterns that dictate diverse roles, expectations and success/ failure criteria for each gender  women are expected to present different patterns of correlation between self-esteem, anxiety and academic performance. The research data was collected during the academic year 2015-2016 at the TEI of Athens. The sample of 763 students surveyed represent 3% of the enrolled students of all faculties and schools of the institution and was collected during three enrollment periods and the first two weeks of attendance of each period. The study protocol was submitted and approved by the Research Committee of the Institute, a few months before the sample selection. The sample selection was conducted by non-proportional stratified sampling as to the School and Faculty of studies. The self-administered questionnaires were distributed by students who had received relevant training, following the briefing of the participants on the research purpose, the procedures, the voluntary nature of their participation, the preservation of their anonymity and confidentiality. Verbal consent was obtained by each participant before the completion of the questionnaire (Figure 1). 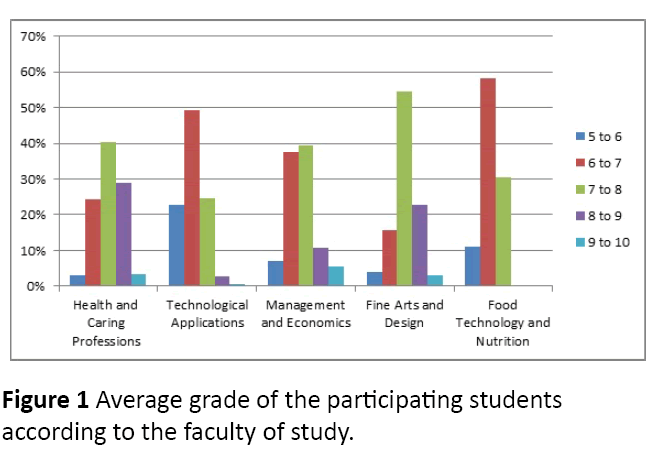 Figure 1: Average grade of the participating students according to the faculty of study. (a) Rosenberg’s Self-Esteem Scale (RSES, Rosenberg)  was used to explore the perceived qualities and the self-concept of the participants. RSES includes 10 questions answered on a 4- point Likert scale (from “strongly agree”=3 to “strongly disagree”=0) and refer to the qualities attributed to the self (“good”, “useless”, “failure”…) and the emotions on the self (pride, satisfaction, respect etc.). The Greek translation of the questionnaire has been standardized on a sample of 652 students of Greek universities  and the results showed high validity and reliability of the instrument (α=0.809). Moreover, the questionnaire included the 5 additional subjects of Rosenberg’s Stability of Self Scale, which assesses whether the self-esteem level is experienced as relatively stable or unstable (with items like, “I find that on one day I have one opinion of myself and on another day I have a different opinion”, “I change from a very good opinion of myself to a very poor opinion of myself” etc.). The Stability of Self Scale has been found to satisfyingly reflect the short-term fluctuations in self-esteem and not its long-term changes (e.g. over a one year period) . (b) The State Trait Anxiety Inventory (STAI), [37,38] was used as a measure of the participants’ anxiety levels. The questionnaire is translated in Greek and standardized for the Greek population, presenting satisfactory validity and reliability [39,40]. STAI includes 40 subjects in total, out of which the first 20 assess the emotional state of the respondent at the time of filling out the questionnaire, namely the state anxiety (A-state) and the next 20 anxiety as a more permanent trait of personality (A-trait). For the purposes of this study, the 2nd subscale was selected which assesses anxiety as a general trait (A-trait). The answers are given on a Likert type 4-point scale, ranging from 1 (“not at all”) to 4 (“very much so”). The total rating on the subscale granted ranges from 20 to 80, while the mean rate of the healthy population is 42, 79 . In the present study, Cronbach’s alpha for the anxiety and self-esteem scale were 0.86 and 0.81 respectively. (c) The last part of the questionnaire included 6 questions about the gender, the age, the semester, the faculty of studies and the academic performance of the participants. Data analysis was performed using the statistical package SPSS v. 21.0 Descriptive statistics such as frequencies, mean and standard deviations was carried out for the variables of the study. Mon parametric tests were conducted due to the non-normal distributions of the independent variables anxiety and self-esteem. Mann-Whitney test, Spearman’s rho and Kruskal Wallis were performed to verify the statistical difference between variables. The level of significance was set at p<0.05. Out of the 763 participants, 34.7% (265 individuals) were male students and 65.3% (498 individuals) were female students. The faculty with the highest number of registered students was the Faculty of Health and Caring Professions with 45.9% of the research participants (350 male/female students), followed by the Faculty of Technological Applications with 22.1% (169 male/female students), the Faculty of Fine Arts and Design with 15.1% (115 male/female students), the Faculty of Management and Economics with 9.7% (74 male/female students) and last one the Faculty of Food Technology and Nutrition with 7.2% (55 male/female students). The student ages ranged from 17 to 45 years, with the mean age of the sample being 20.6 years and the mode being the 19 years. The average grade of all participating students was below 7 for 41.3% of the sample, between 7 and 8 for 38.1% of them and over 8 for 20.6% of the students. As regards the students’ failed courses, the highest mean number of failed courses was obtained by the Faculty of Food Technology and Nutrition (M=7.97, SD=5.7), followed by the Faculty of Technological Applications (M=6.17 SD=5.05), the Faculty of Management and Economics (M=5.42, SD=5.1), the Faculty of Fine Arts and Design (M=5.21, SD=5.24) and the faculty of Health and Caring Professions (M=3, SD=4.61). Female students appeared to have statistically significantly fewer failed courses than the male students of the sample (Z=-5.37, p<0.001). The mean score on the self-esteem scale was higher for the male participants (M=29.65, SD=4.03) than for women (M=28.79, SD=4.08), a difference that was found to be statistically significant (Z=-2.917, N1=265, N2=498, p<0.05, two-tailed test). On the contrary, the students’ age was not found to be related to their self-esteem level to a statistically significant extent. Regarding the academic performance, the average grade was statistically significantly correlated to the students’ self-esteem score (x2=16.26, df=4, p<0.05). More specifically, students with an average grade below 6 were found to have lower scores on the self-esteem scale compared to students who have an average grade over 6. Also, groups of students with higher average grades, like those of 8-9, seem to be significantly different from the group of students with average grades of 9-10, with the latter having higher scores on the selfesteem scale (Ζ=-2.64, Ν1= 111, Ν2=16, p<0.005, two-sided test). Furthermore, a statistically significant negative correlation appeared between self-esteem and the number of failed (ρ=-0.08, p<0.05), i.e., the more courses failed, the lower the score on self-esteem scale. Investigating the possible differentiations between faculties, the Kruskal-Wallis test showed statistically significant differences in self-esteem scores (x2=10.44, df=4, p<0.05). Additional Mann Whitney U test performed between pairs indicated that the students of Faculty of Fine Arts and Design present statistically significantly lower self-esteem scores than all other faculties, i.e., the Faculty of Health and Caring Professions, the Faculty of Technological Applications and the Faculty of Management and Economics (Table 1). Table 1: Mann Whitney U results for the levels of self-esteem and anxiety with the faculty of studies (n=763). The mean anxiety level of all students participating in the research is 44.05, which is somehow higher than the mean level of the healthy population for the specific subscale that is 42.79 . The mean level is 42.06 (SD=9.28) for the men of the sample and 45.11 (SD=10.05) for the women. By applying the Mann Whitney U-test, it was found that the anxiety levels of the female students were significantly higher than those of the male students (Z=-4.024, N1=265, N2=498, p<0.001, twotailed test). The variables of the age and the number of failed courses did not present a statistically significant correlation with the anxiety levels of the sample. However, academic performance displayed a pattern of correlation with the level of anxiety similar to the one found in the case of self-esteem, with the students’ average grade being statistically significantly related to their anxiety score (x2=11, df=4, p<0.05). Students who indicated an average grade below 6 appeared to have a statistically significantly higher score on the anxiety scale compared to the rest grading groups (p<0.05 in all cases). In respect to the faculty of studies, the faculties with the highest scores on the anxiety scale were the Faculty of Fine Arts and Design (M=46.16, SD=9.95), the Faculty of Food Technology and Nutrition (M=46.14, SD=9.58) and the Faculty of Management and Economics (M=44.22, SD=8.89), while the lowest and “healthiest” anxiety scores were obtained by the students of the Faculty of Health and Caring Professions and the Faculty of Technological Applications (M=43.9, SD=10.13 and M=42.18, SD=9.56, respectively). The Kruskal-Wallis test showed that the anxiety scale results are significantly different in the 5 faculties (x2=14.51, df=4, p=0.006). The subsequent application of Mann Whitney tests in pairs, showed that students of the Faculty of Fine Arts and Design have statistically significantly higher anxiety levels than the students of the Faculty of Health and Caring Professions and the Faculty of Technological Applications, while the Faculty of Food Technology and Nutrition students display statistically significantly higher anxiety rates than the Faculty of Health and Caring Professions students (Table 1). The Spearman’s rank order test revealed significant negative correlation between anxiety and self-esteem (ρ=-0.63, p<0.001), with students having higher anxiety scores tending to present lower self-esteem scores, and vice versa. This negative correlation between anxiety and self-esteem applies both to male (ρ=-0.66, df=263, p<0.001) and female population of the sample (ρ=-0.62, df=496, p<0.001). Concerning the stability of self-assessments, students who appear to maintain a stable view of their self that hardly changes (i.e., I feel that nothing can change the opinion I currently hold of myself), present to a statistically significant extent lower anxiety and higher self-esteem levels (Table 2). Table 2: Mann Whitney U results for the levels of self-esteem and anxiety, with the stability of self (n=763). Based on the above mentioned results, students’ age was not found to be associated with their self-esteem level, probably because the majority of the participants (95.8%) are young people between 17 and 25 years old, going through more or less the same process of transition from dependence to autonomy (gradual preparation for the professional world) and dealing with pretty much similar challenges. Besides, the existing research findings on the relation between age and self-esteem are contradictory, with some studies showing an upward trend of self-esteem in the progress from adolescence to early adulthood [42,43] and others the opposite . This discrepancy is usually attributed to the interference of gender differences during puberty, with boys having higher selfesteem than girls during this life stage . In line with other studies conducted in adolescent and student populations [4,44,46], female participants were found to have lower self-esteem levels. Remarkably, although a statistically significant negative correlation was detected between self-esteem and the number of failed courses, separate data analysis for each gender showed that this result mainly concerned male participants. This finding might be attributed to the differential impact of various cultural factors on male and female self-esteem, for instance, the significant influence of physical appearance on female self-esteem, combined to the demanding social standards of attractiveness [47,48]. Indicatively, in her study of the relation between selfesteem, body image and health related behaviors in 423 firstyear college students, Lowery  found that dissatisfaction with physical appearance was the main source of low selfesteem for women, especially in the college environment, where physical appearance may be an important assessment criterion among individuals. The combination of higher anxiety levels and lower self-esteem renders the women of the sample much more vulnerable than male participants. However, a potential confounder that should be taken into account when interpreting the specific result is that women may hold a more moderate position in their self-referent answers . As to the relation between anxiety and self-esteem, the results of this research appear to be in line with earlier studies that show a negative correlation between self-esteem and anxiety level , while the stable perception and assessment of self was found to be related to lower anxiety and higher self-esteem. Several other studies support the same idea, indicating that people who tend to have a more unstable image of the self, which Rosenberg  equates with feelings of insecurity about the self, experience more dissatisfaction with their self  and that a “split” self-image is probably associated with a range of psychological difficulties . As to their academic performance, students with an average grade of 5-6, i.e., those who achieved the lowest passing grade, were also those with the lowest self-esteem and the highest anxiety level, compared to the rest performance groups, which is a reasonable outcome, since it these students probably experience more insecurity about their academic course and their skills. On the other hand, the negative correlation of the number of failed courses to the level of selfesteem, but not to the anxiety level, could possibly imply that the difficulties and the “failures” in the academic course are primarily related to the students’ confidence in their potential and not to the degree of pressure they experience. Besides, the large number of courses not passed could be also a sign of neglect of studies and lack of concern about the educational future, which at a deeper level, however, still impairs the students’ confidence in their potential and ability to fulfill their initial targets. Moreover, based on the results, the Faculty of Fine Arts and Design students seem to be more vulnerable to the combination of high anxiety and low self-esteem, in relation to students who attend other Faculties. In order to interpret this result, several factors should be considered, such as the curriculum of the specific faculty, which is based rather on exploration of ideas and creation than on memorization, the latter being the common practice during much of their school years, as well as the particular sensitivities that students who turn to arts may have. The present study has several limitations, one of which is the lack of data related to other variables that may have a mediating effect on the relation of students’ anxiety, performance and self-esteem, such as their family background, including the economic and educational level of their family, their interactions in peer groups and their interpersonal and social relationships in general. The findings also indicate the need for further research on the factors that underlie gender differentiation in the patterns of correlation between performance, anxiety and self-esteem. An additional limitation of the study derives from the self-reporting nature of the research questionnaire, as individuals may not be fully aware of the totality of their emotions and perceptions of the self, or of the fluctuations that these perceptions may present [54,55]. Further research that would include additional measures of the students educational skills, as well as a follow - up in the same sample of students would be useful, in order to obtain more objective data about the stability of their self-esteem and its relation to their academic performance and anxiety. However, self-esteem and anxiety, rather than being “objective qualities”, they refer to the internal experience of individuals and in this sense, the subjective assessments of individuals on their self are important for planning supportive interventions. In the educational context where this study took place, interventions for anxiety management and self-esteem enhancement could begin from the groups that appear to be more vulnerable to both these parameters, namely fine arts’ students and female population. Furthermore, individuals with unstable self-esteem (and also high anxiety and low selfesteem levels) would be probably more receptive and benefited from a psycho-educational intervention targeted to self-esteem enhancement. During the last decades, the experience from the application of similar interventions has led to several additional considerations as to the recommended methodology. On one hand, there is discrepancy in respect to the effect of selfesteem enhancement programs on the improvement of academic performance, since several studies showed positive results [56,57], while others indicated the opposite . On the other hand, certain authors [3,58,59], presented evidence that questioned the effectiveness of interventions for raising self-esteem or support that such interventions are likely to have negative implications as well, e.g., an increase of the participants’ narcissistic tendencies, or even proneness to violence, depending on the concept of self – esteem and the methodology that is adopted. Furthermore, the cultivation of a frivolous optimism and an excessive belief in the self and in what one can accomplish, might turn out to be destructive, as a possible failure could lead the person to frustration and resignation . In the educational setting, decreased academic performance indicates that both the individual and the educational system need to make several changes in the ways they manage knowledge and learning procedure. In this regard, an intervention to increase self-esteem in the educational context should include not only psychological counseling, but also systematic guidance of students to acquire control over their educational achievements. Therefore, cooperation with teachers would be important in order to help students learn how to set realistic goals, how to respond to failures and how to gain feedback from their mistakes until they achieve their goals . Students’ familiarity with active study and selfregulated learning techniques can enhance both their academic development and their self-esteem [58,62,63] and it would be better to start early in the student life in order to62 have enough time for the relevant skills to be acquired and consolidated [64,65]. Similarly, interventions for stress management could start by focusing on the management of specific issues that cause anxiety to students (e.g. stress of exams, performance anxiety etc. ), moving gradually to other issues, not confined to the educational framework . Besides, the period of studies is for most students a transitional period, where personal and social identity is restructured [66,67]. In the midst of modern socio-economic conditions, the insecurity that characterizes any transition is perhaps even stronger. In this transitional period that presents various challenges, it is important for students to acquire skills to manage everyday stress and foster healthy self-esteem that will allow them to make the best possible choices. This research is funded by the Special Account for Research Grants of the TEI of Athens, in the framework of the Internal Program for the support of the TEI of Athens Researchers, for 2015. Martín-Albo J, Núñez JL, Navarro JG, Grijalvo F (2007) The rosenberg self-esteem scale: Translation and validation in university students. Span J Psychol 10: 458-467. Leontari A (1996) Self-concept (Aftoantilipsi). Ellinika Grammata, Athens. Baumeister RF, Campbell JD, Krueger JI, Vohs KD (2003) Does high self-esteem cause better performance, interpersonal success, happiness or healthier lifestyles? Psychol Sci Public Interest 4: 1-45. Baumeister RF (2013) Self-esteem: The puzzle of low self-regard. Springer Science and Business Media, New York. Rosenberg M (1965) Society and the adolescent self-image. Princeton University Press, Princeton NJ. Bibring MD (1953) The mechanism of depression. In P Greenacre affective disorders International University Press, New York. pp: 14-47. Mruk CJ (2013a) Self-esteem and positive psychology (4th edn). Springer Publishing, New York. Baumeister RF, Smart L, Boden JM (1996) Relation of threatened egotism to violence and aggression, the dark side of high self-esteem. Psychol Rev 103: 5-33. Leontari A (2012) Self-esteem: A basic psychological need. In: Chatzichristou and Bezevegis, Psycho-education: Issues of child development and adaptation in family and school. Pedio, Athens. pp: 299-321. American Psychiatric Association (2013) Diagnostic and statistical manual of mental disorders (5th edn). APA, Washington, DC. Myers DG (2002) Social psychology (7th edn). Mc Graw Hill, London. Heimberg RG, Becker RR (2002) Cognitive-behavioral group therapy for social phobia. Guilford Press, New York. Creemers DHM, Scholte RHJ, Engels RCME, Prinstein MJ, Wiers RW (2013) Damaged self-esteem is associated with internalizing problems. Front Psychol 4: 152-152. 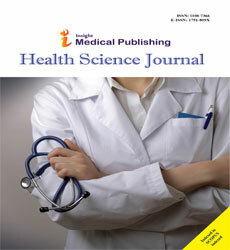 Sowislo JF, Orth U (2013) Does low self-esteem predict depression and anxiety? A meta-analysis of longitudinal studies. Psychol Bull 139: 213-240. Manna G, Falgares G, Ingoglia S, Como MR, De Santis S (2016) The relationship between self-esteem, depression and anxiety: Comparing vulnerability and scar model in the Italian context. MJCP 4: 3. Patton W, Bartrum DA, Creed PA (2004) Gender differences for optimism, selfesteem, expectations and goals in predicting career planning and exploration in adolescents. Int J Educ Vocat Guid 4: 193-209. Ikechukwu U, Siti NY, Mansor AT, Sakineh M, Rohani A (2013) Effect of self-esteem in the relationship between stress and substance abuse among adolescents: A mediation outcome. IJSSH 3: 214-217. Chufar BM, Pettijohn TF (2013) Meeting high standards: the effect of perfectionism on task performance, self-esteem and self-efficacy in college students. Psychol Behav Sci 2: 118-123. Zajacova Α, Lynch SM, Espenshade TJ (2005) Self-efficacy, stress, and academic success in college. Res High Educ 46: 677-706. Pullmann H, Allik J (2008) Relations of academic and general self-esteem to school achievement. Pers Individ Dif 45: 559-564. Marsh H, O’Mara A (2008) Reciprocal effects between academic self-concept, self-esteem, achievement and attainment over seven adolescent years: Unidimensional and multidimensional perspectives of self-concept. Pers Soc Psychol Bull 34: 542-552. Malbi RS, Reasoner RW (2000) Self-esteem enhancing. Self-Esteem Seminars Sdn. Bhd, Kuala Lumpur. Tsiga E, Nasaina E (2012) The contribution of self-esteem in students’ academic achievement. Proceedings of the Greek institute of applied pedagogy and education (ELLIEPEK). Owens RL, Patterson MM (2013) Positive psychological interventions for children: A comparison of gratitude and best possible selves approaches. J Genet Psychol 174: 403-428. Lawrence D (2000) Building self-esteem with adult learners. Sage, London. Yanti R, Hidayatulfathi O, Ismarulyusda I, Syari HL, Husin L, et al. (2012) Self-esteem and academic performance relationship amongst the second year undergraduate students of University Kebangsaan Malaysia, Kuala Lumpur Campus. Procedia Soc Behav Sci 60: 582-589. Papadioti-Athanasiou V (1999) Self-esteem in relation to the performance and acceptance of the student from the group of peers. Scientific Annals of the Department of Philosophy, Education and Psychology, University of Ioannina School of Philosophy, Dodoni, Ioannina. Besser A, Zeigler-Hill V (2012) Positive personality features and stress among first-year University students: Implications for psychological distress, functional impairment and self-esteem. Self Identity 13: 24-44. Preston J, Hammond C (2002) The wider benefits of learning: practitioners views. The centre for research on the wider benefits of learning. Research Reports. Chung JM, Robins RW, Trzesniewski KH, Noftle EE, Roberts BW, et al. (2014) Continuity and change in self-esteem during emerging adulthood. J Pers Soc Psychol 106: 469-483. Kennedy H (1997) Learning works. Widening participation in higher education. FEFC, Coventry. McGivney V (2001) Fixing or changing the pattern. NIACE, Leicester. Pandey A, Chalise HN (2015) Self-Esteem and academic stress among nursing students. KUMJ 13: 298-302. Emler N (2001) Self-esteem: The costs and causes of low self-worth. York Publishing Services-Joseph Rowntree Foundation Paperback, York. Galanou C, Galanakis M, Alexopoulos E, Darviri C (2014) Rosenberg self-esteem scale Greek validation on student sample. Psychology 5: 819-827. Webster GD, Smith CV, Brunell AB, Paddock EL, Nezlek JB (2016) Can Rosenberg’s Stability of Self Scale capture within-person self-esteem variability? 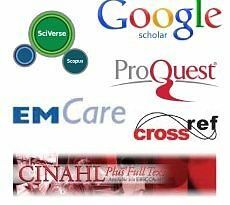 Meta-analytic validity and test–retest reliability. J Res Pers 55: 112-126. Spielberger CD (1972) Anxiety as an emotional state. Anxiety: current trends in theory and research. Academic Press, New York. Spielberger CD (1984) State–trait anxiety inventory: A comprehensive bibliography. Consultant psychologists Press, Palo Alto, CA. Liakos A, Giannitsi S (1984) Reliability and validity of the modified Greek version of the Spielberger State-Trait Anxiety Inventory. Encephalos 21: 71-76. Fountoulakis KN, Papadopoulou M, Kleanthous S, Papadopoulou A, Bizeli V, et al. (2006) Reliability and psychometric properties of the Greek translation of the State-Trait Anxiety Inventory form: Preliminary data. Ann Gen Psychiatry 5: 2. Anagnostopoulou T (2002) Spielberger anxiety questionnaire. In: Stalikas, Triliva, Roussi (eds). Psychometric tools in Greece, Ellinika Grammata, Athens. pp: 81-84. Zeigler-Hill V (2013) Self-esteem. Psychology Press, New York. Bleidorn W, Arslan RC, Denissen JJA, Rentfrow PJ, Gebauer JE, et al. (2016) Age and gender differences in self-esteem. A cross-cultural window. J Pers Soc Psychol 111: 396-410. Connor JM, Poyrazli S, Ferrer-Wreder L, Grahame KM (2004) The relation of age, gender, ethnicity and risk behaviors to self-esteem among students in nonmainstream schools. Adolesc 39: 457-473. Cribb VL, Haase AM (2016) Girls feeling good at school: School gender environment, internalization and awareness of socio-cultural attitudes associations with self-esteem in adolescent girls. J Adolesc 46: 107-114. Patitsa Ch, Chaniotis D, Chaniotis F, Leivadara M, Venetikou M, et al. (2011) The relation between self-esteem, body mass index, state anxiety and physical activity: Research in student population. Ε-JST 3: 103-117. Harter S (2000) Is self-esteem only skin-deep? Reclaiming children and youth 9: 133-138. Fernandez S, Pritchard M (2012) Relationships between self-esteem, media influence and drive for thinness. Eat Behav 13: 321-325. Lowery SE (2005) Body image, self-esteem and health-related behaviors among male and female first year college students. J Coll Stud Dev 46: 612-623. Maehr ML, Nicholls JG (1980) Culture and achievement motivation: A second look. In: Warren NL (ed. ), Studies in cross-cultural psychology. Academic Press, San Diego, CA. pp: 221-267. Rosenberg M (1985) Self-concept and psychological well-being in adolescence. In: Leahy R (ed. ), The development of the self, Erlbaum, Hillsdale, NJ. pp: 205-246. Hormuth SE (2010) The ecology of the self. Cambridge University Press, New York. Lester D (2015) On multiple selves. Transaction Publishers, New York. Kernis MH (2006) Self-esteem issues and answers: A sourcebook of current perspectives. Psychology Press, New York. Murk CJ (2013b) Defining self-esteem as a relationship between competence and worthiness: How a two-factor approach integrates the cognitive and affective dimensions of self-esteem. Pol Psychol Bull 44: 157-164. Scheirer MA, Kraut RE (1979) Increasing educational achievement via self-concept change. Rev Educ Res 49: 131. Sygkollitou E (1997) School performance and change in social status and self- esteem of students. Psychology 4: 32-47. Valentine JC, DuBois DL, Cooper H (2004) The relation between self-beliefs and academic achievement: Ameta-analytic review. Educ Psychol 39: 111-133. Twenge JM (2006) Generation me: why today’s young Americans are more confident, assertive, entitled and more miserable than ever before. Free Press, New York. Angelakopoulou CH (2015) Self-esteem in education. A philosophical approach. Diploma thesis. University of Patras, Department of Educational Sciences and Early Childhood Education. Skinner EA, Pitzer J (2012) Developmental dynamics of engagement, coping, and everyday resilience. In: Christenson SL, Reschly AL, Wylie C (ed. ), Handbook of research on student engagement. Springer, New York. pp: 21-44. Yorra ML (2014) Self-efficacy and self-esteem in third-year pharmacy students. Am J Pharm Educ 78: 134. Oyserman D, Destin M, Novin S (2015) The context-sensitive future self: Possible selves motivate in context, not otherwise. Self Identity 14: 173-188. Lent RW, Brown SD (2006) Integrating person and situation perspectives on work satisfaction: A social-cognitive view. J Vocat Behav 69: 236-247. Richardson Μ, Abraham C, Bond R (2012) Psychological correlates of university students’ academic performance: A systematic review and meta-analysis. Psychol Bull 138: 353-387. Erikson E (1968) Identity: youth and crisis. WW Norton and Company, New York. Zhu S, Tse S, Cheung SH, Oyserman D (2014) Will I get there? Effects of parental support on children’s possible selves. Brit J Educ Psychol 84: 435-453.